The latest Urban Outfitters catalog is like a blast from the past. But instead of pretty, mythic Joan-from-Mad Men-retro, the clothes inside are a vivid acid (wash) flashback — a living nightmare starring some of my worst '90s fashion moments. Beverly Hills Cop came out in 1984, and Eddie Murphy saw white people wearing red Thriller jackets and laughed and laughed and laughed. At the time, I wanted one so badly. Fast forward about seven or eight years, and the country was in the grips of a leather motorcycle jacket frenzy. 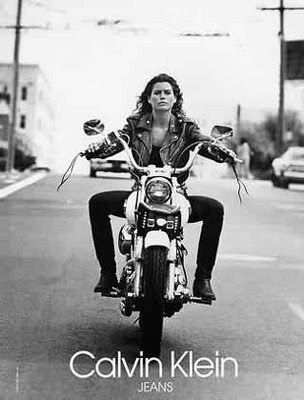 This picture of Carré Otis astride a hog was hung up in my little sister's room, and we both dreamed of the perfect motorcycle jacket. I eventually bought one — already broken in — off of my Ramones-loving friend Chris, who hated that they'd become mainstream. My sister's came from Bloomingdale's, I think. Later she'd become an cruelty-free fabric wearing vegetarian veterinarian. But I suspect we both would have wanted this peach version. At the time. I had pants similar to this in 1982 or 1983; but they were black and had stirrups. I wore them to Mitchell's bar mitzvah with a cummerbund and a black dress shirt pinned at the throat with a large rhinestone brooch. This is similar to the outfit I wore in the car on my way to see Lollapalooza in 1992. The Chili Peppers, Pearl Jam and Ice Cube were on the main stage; but Cypress Hill was on the side stage! This isn't what I wore to the show, of course: I changed into a poet's blouse with velvet choker. Duh. The shoes are not blasts from the past, but they are fug. My favorite pleated jeans were actually shorts, which were sometimes worn with backwards suspenders. I cringe now. Terrible choices were made. His initials were A.T. He had those wounded eyes obligatory for misunderstood and maladjusted high school boys. I was into George Michael and Taylor Dayne; he was into to Zeppelin. We exchanged lingering glances in homeroom. He sat in front of me in math, reeking of weed. I stared at the back of his head, willing him to turn around, and, at the same time, hoping he wouldn't. He wore this — or something like it — every damn day. His best friend C.T. wore this. Floral dresses, worn with chunky, mannish shoes — or Doc Martens — were a Big Thing. Part of me remembers the comfort; part of me thinks some things are best left in the past. WAIT. Polaroid is making a comeback? That's a blast from the past I can get behind.